It is no secret that Poblacion is currently one of the hottest spots in Manila. With so many places to see, eat at, and drink in; you have most probably been to the area at least once with your friends. If you still haven’t explored what this area has to offer or if you ever want to explore it a little bit more with your significant other or your friends, you might want to think about staying there for a night or two. This is where Oxford Suites come in. 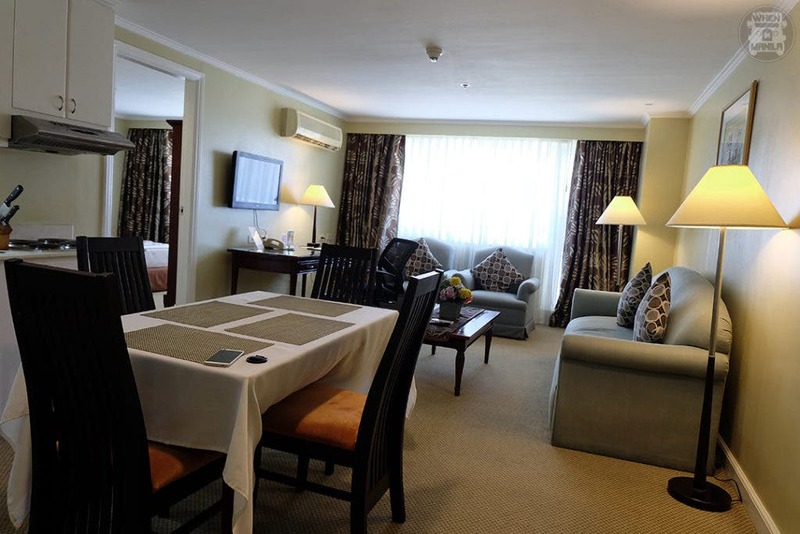 Although Oxford Suites might sound and look like a business hotel to most people and although it might look intimidating at first because of this fact, there are several reasons why you should consider Oxford Suites as your next staycation destination in Makati. Oxford Suites Makati is a 27-story boutique property within walking distance of Makati’s central business and entertainment districts. So, even if you only plan on spending your nights exploring Poblacion; you can visit other popular Makati destinations around the area during the day, including its many malls. It is even close enough to make a trip to BGC! Plus, it is right next to Filling Station, so you can enjoy some diner feels right outside of the boutique hotel if you ever feel like it. You don’t really need to leave Oxford Suites at all if you don’t want to, though. They have a bar and restaurant downstairs where you can eat good food in peace any time of the day. They even have an acoustic band if you want to hear some good music while sipping on some drinks. Each room in Oxford Suites is also fully equipped with amenities to ensure your comfort and convenience, regardless of whether you plan to stay there for a single night, a weekend, a long weekend, or even an entire week. You can treat each space as your personal sanctuary as you enjoy every stay in the hotel. The 31 sq.m. Executive Room has a queen bed and is perfect for couples looking to enjoy a quick staycation. If you want a bit more space, book the 51 sq. m. Junior Suite, which also has a queen bed. The 40 sq. m. Deluxe Room comes with one queen bed or two double beds. If you’re planning on a longer staycation, you might want to stay in the spacious 100 sq. m. One Bedroom Suite, which has a queen bed, a kitchenette, and a living room! You can cook basic dishes here with ease and sit at a proper dining table to eat. You even have a mini workstation, so you can work uninterrupted while others rest in the bedroom. There is also enough couch space to keep everyone happy. Plus, you can stay in a One Bedroom Suite with a super spacious balcony and a stunning view of the Makati Skyline. Definitely worth it! What you really need to see, though, is the huge O-Suite. This bright and luxurious presidential suite is actually a loft and has floor-to-ceiling glass window panels with the same gorgeous view of the Makati skyline. You definitely won’t mind getting some work done here. The bedroom is upstairs, secluded from the spacious living room, so you can get all the privacy you need for yourself, for business meetings, or for entertainment. Of course, Oxford Suites also has other amenities to make your stay as comfortable and as convenient as possible. Open from 6AM to 10PM everyday, you can get your daily workouts done at their fitness center, which has cardio machines and weights. They also have function rooms called the Hampton Rooms, which are readily-equipped for all of your function room needs. They have ceiling-to-floor glass windows and can comfortably seat up to 100 people. The meeting hall can also be converted into two separate banquet rooms if needed. That aside, you can also book for an in-room massage with ease to let all of your stress melt away. The best part of this is that their rates are super affordable despite the great rooms that they have available. Check them out and plan your next staycation now!